The name "Durham" comes from the Old English "dun", meaning hill fort, and the Old Norse "holme", which translates to the island. 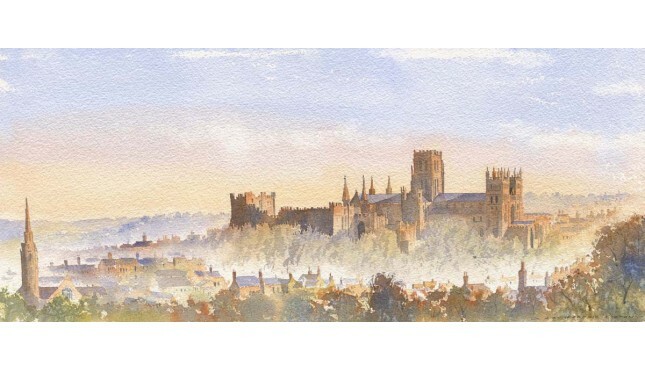 The Lord Bishop of Durham takes a Latin variation of the city's name in his official signature, which is signed "N. Dunelm". Some attribute the city's name to the legend of the Dun Cow and the milkmaid who in legend guided the monks of Lindisfarne carrying the body of Saint Cuthbert to the site of the present city in 995 AD. Dun Cow Lane is said to be one of the first streets in Durham, being direct to the east of Durham Cathedral and taking its name from a depiction of the city's founding etched in masonry on the south side of the cathedral. The city has been known by a number of names throughout history. The original Nordic Dun Holm was changed to Duresme by the Normans and was known in Latin as Dunelm. The modern form Durham came into use later in the city's history. The northeastern historian Robert Surtees chronicled the name changes in his History and Antiquities of the County Palatine of Durham but states that it is an "impossibility" to tell when the city's modern name came into being. As you cross the bridge to the old shopping streets of Durham the Castle peeps over the top of th.. This is perhaps one of the most iconic views of Durham Cathedral. Standing on the banks of the River..
David was born in a village near Durham and has fond memories of visiting this place. The statue in ..